Case Type Keep Case (Amaray) DVD Extras: Animated Menus, Troma Studios Tour, The Troma Intelligence test, Lost scenes rescued from Tromaville, Exclusive interview with Toxie today, Never before seen Movie stills (Including Marisa Tomei), Original Theatrical Trailer, Samples from the Toxic Crusaders animated TV series, The Radiation March, Actor Mark Togel secrets, The shocking truth of making of Toxic Avenger, The Aroma du Troma, and more, more, more. 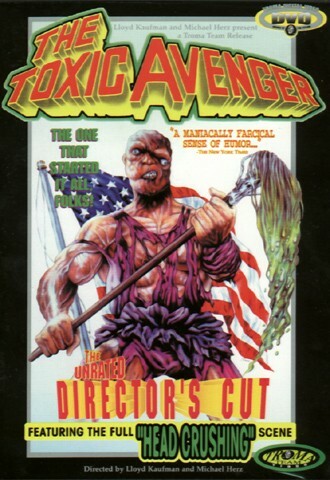 The Toxic Avenger is regarded a classic, and the movie`s got thousands of fans all over the world. 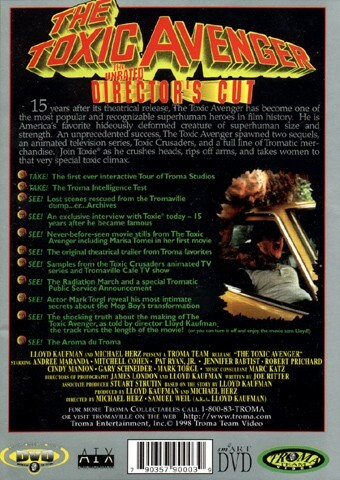 Troma are the kings of b-movies, and they`re proud of it. Watching The Toxic Avenger is entertaining and funny. It`s almost like it`s not a real movie, because it`s not like anything you`ve seen in a typical Hollywood movie. The humour and behavior of the characters are bizarre, but still it is charming as well. I really had a good time during this movie, and particularly i enjoyed the carsplatting scene at the beginning. The movie has got beautiful mean girls, a large portion of self irony and a kind but disgusting monster. This combination gives the The Toxic Avenger a good moral. I give the film 4 on a scale from 1-6.